Tiger Tales: A Detroit Tigers Blog: How many Runs Will The Tigers Allow In 2017? How many Runs Will The Tigers Allow In 2017? 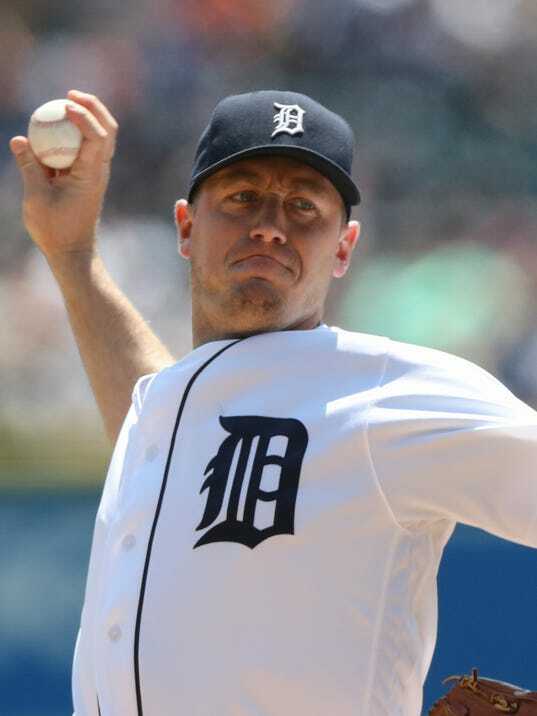 The Tigers are hoping for a come back season in 2016 from right-handed starter Jordan Zimmermann. Now that I have projected the Tigers runs scored total for 2017, the next step is to estimate how many runs they will give up. While I have been quite accurate in my runs scored projections the last few years, I have not been so successful in forecasting runs allowed. Run prevention is more difficult to predict because pitcher's arms are so fragile and their performance so volatile. I have undershot the Tigers eventual run total the last three years - 65 runs short in 2014, 129 run in 2015 and 30 runs last year. Just before the 2016 season got under way, I wrote just that the Tigers would allow 691 runs. They went on to score 721 runs, so I was within 4%. As is often the case with pitching, a lot of things went wrong, Newly acquired starter Jordan Zimmermann was injured most of the season and ended up with a 4.87 ERA which is almost a run and half higher than his career ERA. Hold over Anibal Sanchez was even worse posting an ERA (5.87) about two runs above his career average. Bullpen acquisition Mark Lowe also disappointed spectacularly finishing with a 7.11 ERA allowing 12 home runs in 49 innings. Fortunately, some things went right as well. Ace Justin Verlander had his best season since 2012 posting a 3.04 ERA and a league-leading 254 strikeouts. Additionally, twenty-three-year old Michael Fulmer surprised with a 3.06 ERA and was named the American a Rookie Of The Year. General Manager Al Avila stood pat during the off-season which means the 2017 staff will look very similar to 2016. The hope is that Verlander and Fulmer will repeat their success and that Zimmermann will be healthier and better this year. Many fans are also expecting continued progress from young starters Daniel Norris and Matt Boyd and hard-throwing reliever Bruce Rondon. For example, Justin Verlander allowed an average of 98 runs per 220 innings (his projected 2016 total) from 2014-2016. He also allowed 92 Base Runs and 86 FIP Runs. The average of the three numbers above (98, 92, 86) is 92. I expect Verlander to be similar to his three-year average next year with maybe a slight age-related decline. I'm estimating 95 runs allowed. I project the rest of the pitchers similarly moving them up or down from their three-year averages if I think they are going to get better or worse this year. In particular, I'm guessing that a couple of starters will do worse than their three-year averages: (1) Despite his poor season in 2016, Zimmermann's three-year average is still boosted two much by his two years in Washington in the league with no designated hitter. It is also likely that he will never regain his former velocity. (2) Fulmer performed a bit better than expected last year and struggled down the stretch. He should still be good this year, but may suffer some growing pains. While I do not expect any dramatic improvements from any of their young starters, I do expect Norris and Boyd to pitch more innings this year which means fewer innings for Sanchez, Mike Pelfrey and replacement level youngsters. My estimates of 750 runs scored and 700 allowed yields a differential of 50 runs or five wins above .500. Thus, my early call for the season is a 86-76 which would be equal last year's win total. I will check in again after spring training and make adjustments should there be injuries or surpises over the next several weeks. Your IP projection for Zimmermann and Fulmer are clearly, wrong. Fulmer was near that last year (minor + Majors), he'll hit 200 easy, and he seems durable as heck. Zimmermann has been a 200ish inning guy for 4 seasons before last year. As long as he's healthy, and the word is that the injury is either gone or being managed by injection. Norris pitched more than 150 last year (m + M). He has been injury prone, but last years was not pitching related. He's young, fit, with sick stuff, he's a bull dog, a kid who wants to be a #1 ace, horse starter. He's taken this off season more seriously than previous once and I'd expect him to get close to 190 IP. Penciling Boyd in as #5 is a bit of a stretch, he has options left, he's going to starting in Toledo, Sanchez will start unless he looks terrible, ditto Pelfrey and Lowe. Ryan will be in Toledo. Mr Anonymous, Thanks for reading my article. I'm not sure how one can be CLEARLY wrong about something that has not happened yet. There will almost surely be injuries and if you don't factor them in, you are going to overrate every team. We don't know who will be injured, but we can guess who is most likely to get hurt. All the projection sites do that. As for Sanchez, Pelfrey and Lowe, I am going to guess that at least one of them gets released before the season or early in the season and the others will have short leases. I agree there is a good chance Boyd starts the season in Toledo, which is why I have him at only 125 innings. Nice breakdown, as usual. We really need Zimmerman to return to form to have much of a chance,don't we? It really is tough to project his innings and just how effective he will be. I think your projections for Fulmer are about right, he was not nearly as dominant the second half of the year. I think Boyd will be with the big club most if not all of the season. I think he may be the real pleasant surprise this year. I expect the Tigers to move either Sanchez or Pelfrey, taking the financial hit, and keep the other for long relief. OK, so the Tigers score 750 and allow 700. How many wins does Mr. Pythagoras say that is worth? And how likely is that to get them into the playoffs? BTW, it is awfully nice to have you back, Lee. nocynic, A 50 run difference is worth five wins on average. So, that would be 86 wins. That likely wouldn't win the division, but would probably put them in the wild card race. I am not really "back". I am still very busy with other stuff, but will try to post occasionally. How Many Runs Will The Tigers Score in 2017?